Cytology of polymorphous low-grade adenocarcinoma (PLGA): The tumor cells are monomorphic, small to medium-sized and with minimal atypia. The nuclei are uniform, round to oval, with vesicular chromatin and inconspicuous nucleoli. The cells have moderate amount of amphophilic or eosinophilic cytoplasm with indistinct borders. Rare mitotic figures may be present (as shown here). Atypical mitotic figures and necrosis are not seen. Other histologic features that may be seen include perineural invasion; entrapment of residual minor salivary glands; invasion of adipose tissue, skeletal muscle, and bone. De-differentiation:Rare cases with typical histology of PLGA may show areas of de-differentiation consisting of marked anaplasia, increased mitotic activity, high Ki-67 proliferation index, and necrosis. 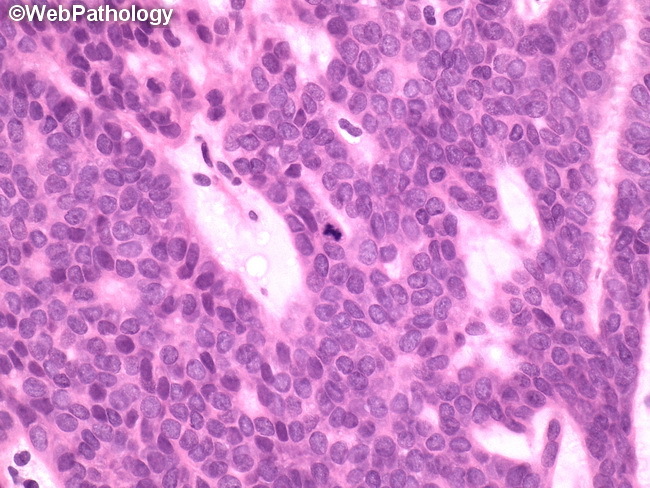 The high-grade areas may resemble salivary duct carcinoma.